Cone beam computer tomography (CBCT) guidance is a new technology that allows Dr. Renato Aves of the Tampa Bay Institute of Oral Surgery and Dental Implants to build a three-dimensional model of your jaw and teeth. Using the latest nSequence modeling software and cone beam CT scans, Dr. Aves is able to plan complex dental restoration using dental implants before proceeding with actual surgical procedures. 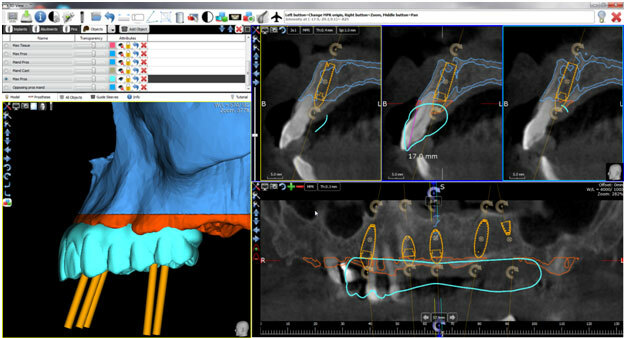 With software guidance and a specialized computer using CT technology, he plans the positioning of implants in relation to the bone and ideal tooth position. After planning your individualized CT guided treatment, Dr. Aves uses a surgical guide to drill into your bone tissue at the exact position and on the precise angle that has been planned for your ideal treatment. This assures the best final results for health, function, and the appearance of your smile. Our clinical and office team of the Tampa Bay Institute of Oral Surgery and Dental Implants has one goal, and that is to provide you with the best oral surgery experience and outcomes. We will answer all of your questions and assist you with financial arrangements and filing insurance claims. Your safety and comfort are of primary concern to us. Patients are typically sedated using IV moderate sedation or oral moderate sedation during all surgical procedures so you are relaxed and fully comfortable during your surgical appointments. Your first appointment is free! We offer complimentary (no fee) initial and second opinion consultation appointments. Dr. Renato Aves will talk with you, examine your mouth, and do any required digital x-ray imaging. At your initial appointment, this imaging is free of charge. We also include a 3D cone beam CAT scan, if one is required. A CAT scan alone is valued at $475.00. Call us for your free initial consultation and learn the details of what Dr. Aves recommends for your individual circumstances. Call today!